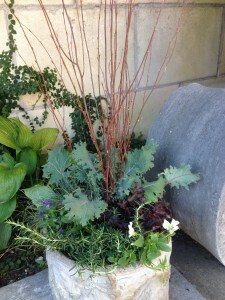 Frank Stitt’s Chez Fonfon & Bottega Restaurant’s Planters…Done! Chez Fonfon restaurant next to his acclaimed restaurant, Highlands Bar & Grill. Pardis Stitt, Frank’s wife, likes Chez Fonfon to have a simple color scheme of white and green, and she and I both love different foliage colors, textures and leaf patterns, so it’s always fun to put together combinations of foliage with a few white flowers to brighten things up. The planters are in quite a bit of shade, both from the building and from trees planted there, so for flowers it’s violas for winter. The emphasis is on foliage, though, and I’ve included curly parsley for it’s fresh green color, a small blue fescue grass, and a shade loving heuchera for this planting. 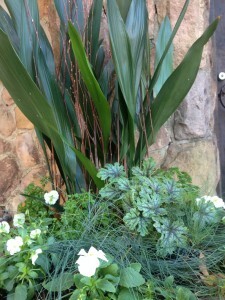 Holdovers from the summer are aspidistra, which I thin out each season, and a tiny leaf green ivy. After planting, I added birch branches to add more height and winter interest. (Branches are an easy way to get color in planters during the holiday – red twig dogwood branches would also be pretty.) While it looks a bit top heavy with the tall aspidistra at first, the parsley and heuchera will add fullness to the composition as it grows in. I’m also trying the Cool Wave white trailing pansies here this year, hoping they get enough sun to bloom well. 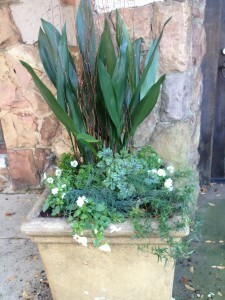 This fall Pardis asked if I would also take a look at the planters at Bottega, their other wonderful restaurant. They are smaller and placed in the courtyard. I’ve included pictures of the two on either side of a wall fountain and shade garden. Because they’ll get more sun than the planters at Chez Fonfon, I’ve included one of my favorite ornamental (and edible!) kale, ‘Red Russian’, for height, a dark leaf heuchera on the shady side of the planter, trailing rosemary and more of the Cool Wave trailing pansies. I especially love the contrast of the birch against the lightness of the wall. It will be fun to watch all of these grow out, knowing their dedicated staff take great care to keep them looking their best. 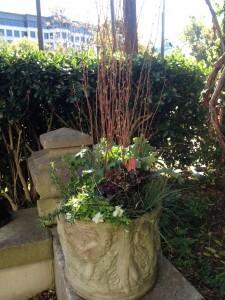 This entry was posted in Annuals, Container, Container Gardening, Fall, Flowers, Perennials, Planting Tips and tagged bottega planters, chez fonfon planters, container gardening, fall container gardening on November 9, 2013 by Kris Blevons.